Hello. 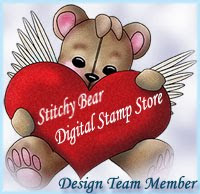 Here is my post as DT at Sweet Pea Stamps. This month our Artist of the Month is Mitzi Sato Wiuff. For my project i picked one of her gorgeous Sprites images. This one call "Dandelion sprite". So, so cute! I colored image with Inks and pencils. Here is my cute felt Dandelions flowers, that i made. And just a splash of color by adding ladybugs. I used MS punch, to make a border on the side of my card, and some corner punch and dies.